Zaanse Schans is one of the most historical places of Holland where you can relive the 18th century. This little neighborhood is located in “Zaandam” (near Amsterdam) and is famous because of its beautiful scenery with typical windmills and 18th century houses. The largest museum here is the “Zaans museum en Verkade Experience”; Verkade is the famous Dutch chocolate factory. You may see objects as clothing, paintings and materials of the largest cookie and chocolate factory of 20th century in Holland. The monumental Honig Breethuis will show you how a typical Zaanse merchant family lived back in the year 1830. The owner of the white paper mill “The Vergulde Bijkorf”. In the ‘Molenmuseum’ a large collection of scale models is shown of oil-, paper-, peeling- and wood saw mills. It gives you a complete overview of the rise and fall of industrial (wind-)mills. The models show how the windforce was and therefore taken by the blades and transferred by different but ingenious mechanisms in the heart of the windmill. These mechanisms were different per mill. 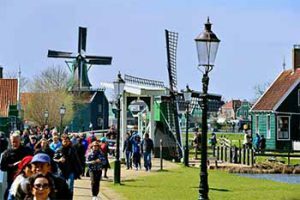 For visiting the Zaanse Schans and the larger Region of Amsterdam you may buy the Amsterdam & Region Travel Ticket for 1-2-3 days.